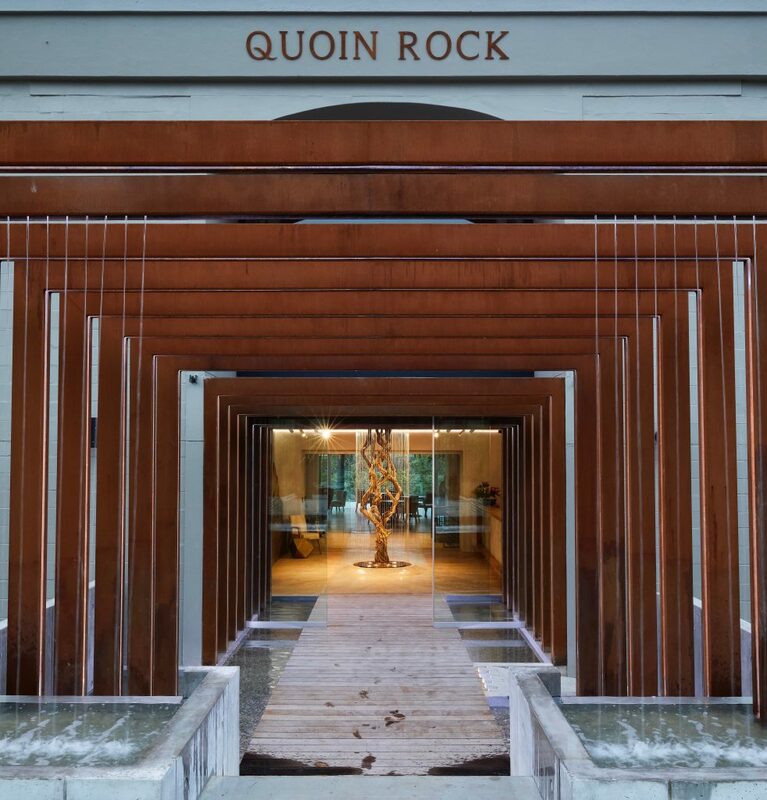 Located on the slopes of the Simonsberg, the Quoin Rock wine estate just reopened its doors to the public after a lengthy, no-expense-spared renovation of the winery, vineyards and restaurant by the Vitaly Gaiduk family, which purchased the 200 hectare property in 2012. We joined Mike Bampfield-Duggan of Wine Concepts at Quoin Rock last week to taste wines with winemaker Jacques Maree and to experience the 16 course tasting menu prepared by Michelin chef Rikku O’Donnchu. Our tasting notes appear along with descriptions of selected dishes they were paired with. Quoin Rock has 36 hectares of vineyards on its Stellenbosch estate and another 11 ha of mostly white grapes in another large estate located in Elim. Most of the white wines are made of a blend of grapes from the two sites, while the reds are sourced from Stellenbosch. 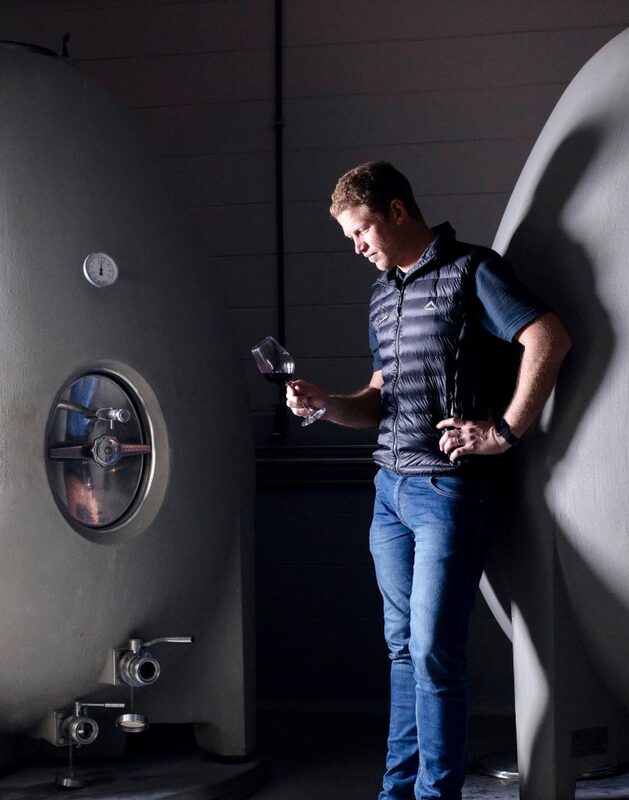 Jacques Maree joined Quoin Rock in 2015 after winemaking stints in foreign countries, including Sonoma’s Kosta Browne. Jacques’ wines are fresh, balanced and very good as shown in the tasting notes below. Quoin Rock’s restaurant Gåte is appropriately named. In Norwegian, it means the beginning of a labyrinth, an adventure to be enjoyed without knowing precisely how it will end. Chef Rikku’s 16 courses are themselves and adventure, beautifully presented in the style that he first became famous for on BBC’s MasterChef. The menu is meant to be playful and fun, sometimes playing little tricks on the diner, like the first of the 16 plates. 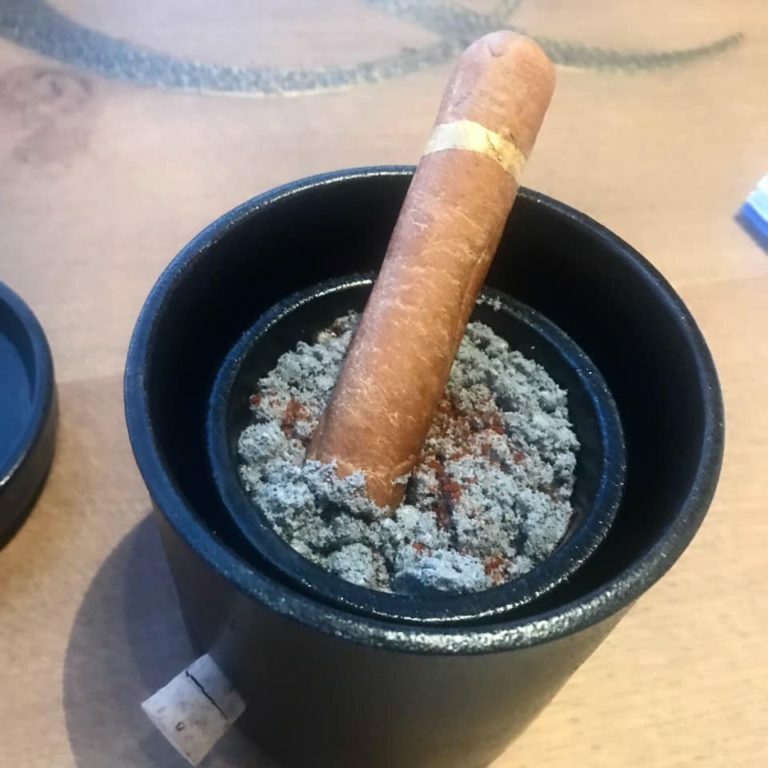 Named Not A Cigar, it’s a rye bread “cigar” eaten by dipping it in and “ash” of fermented garlic, tomato powder, and black olive espuma. 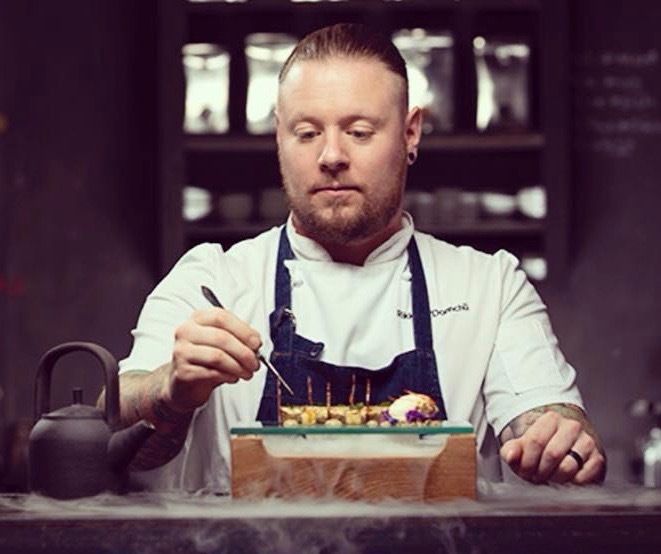 While Rikku likes having fun with food, he arrives at Quoin Rock with serious credentials, including stints at The French Laundry and The Fat Duck. Originally from Nottingham, England, he started out as front man for the British metal band The Parasite Syndicate before entering the world of fine cuisine. And the food at Quoin Rock is indeed fine, although it’s the presentation that makes the experience truly unique. Selections from the 16 plates are pictured below. Cured Oysters: Raw, briney West Coast oysters served with a Champagne umami foam and sauce of cream, bacon and green strawberries. The presentation on a glass bowl of stones and dry ice evokes the white clouds that often roll off Table Mountain. Paired with the 2013 Brut, a 50/50 blend of Chardonnay [from Elim] and Pinot Noir [from Walker Bay], whole bunch pressed, fermented and matured 10 months in 225 L barriques, followed by almost 5 years on the lees in bottle. Leesy with pear and shortbread notes, this is a refined sparkler with rich lemony extract that paired nicely with the oysters. 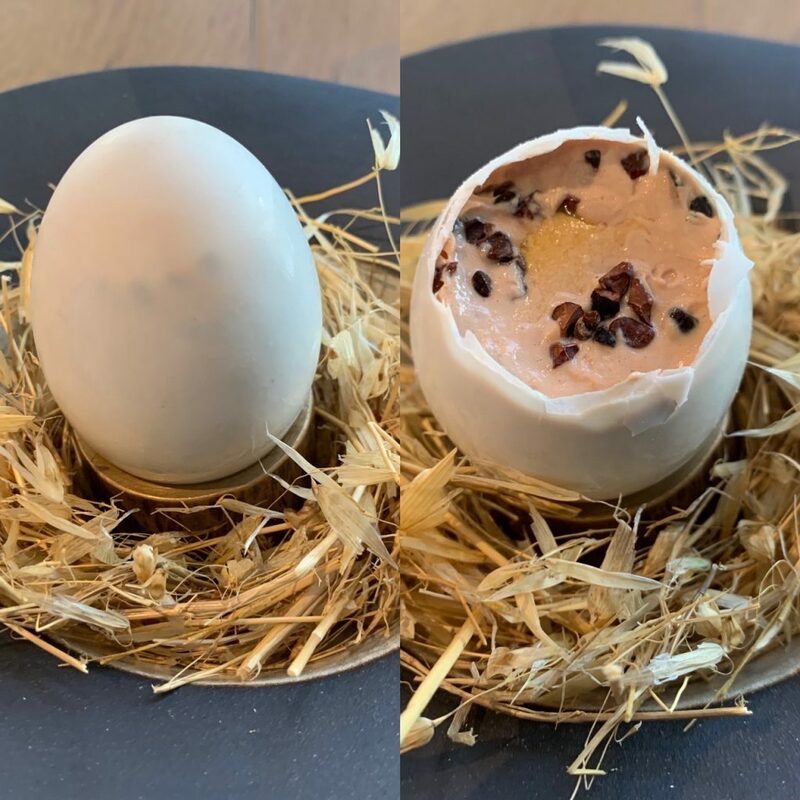 The Birth of Liver: A duck egg filled with fois gras and banana cream and black olive that’s eaten like a soft boiled egg. Served with the 2014 Brut, a 54/46 Pinot Noir and Chardonnay blend that’s especially lively and fresh on a full bodied palate. Good acidity and a chalky texture cut through the richness of the foil gras. 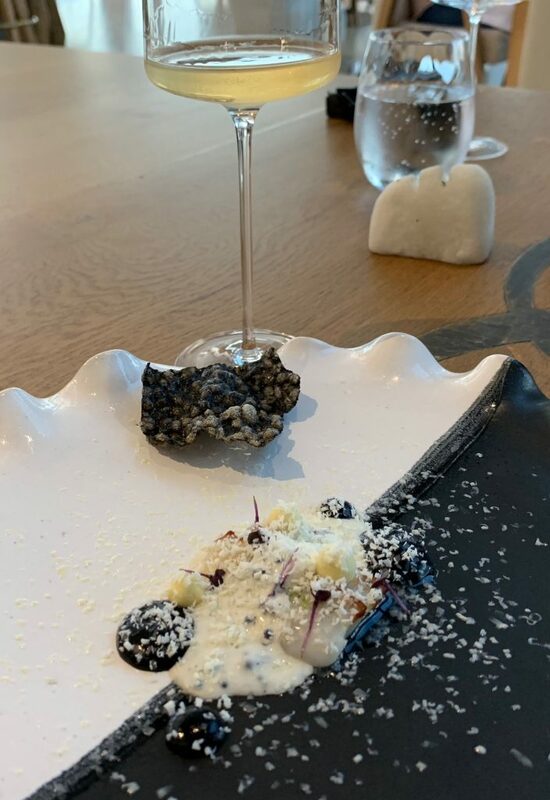 Black Pearl: Scallop served with a cauliflower vanilla puree, gorgonzola, lime and beluga caviar with a touch of grated white chocolate and a crisp of black squid ink. Served with the 2017 Namysto Sauvignon Blanc/Semillon from the Western Cape. Predominantly (95%) Sauvignon Blanc from Elim with fynbos and lime scents and gooseberry, lychee and passion fruit flavors. Excellent depth of flavor and a touch of salinity make this a good match with the scallop. 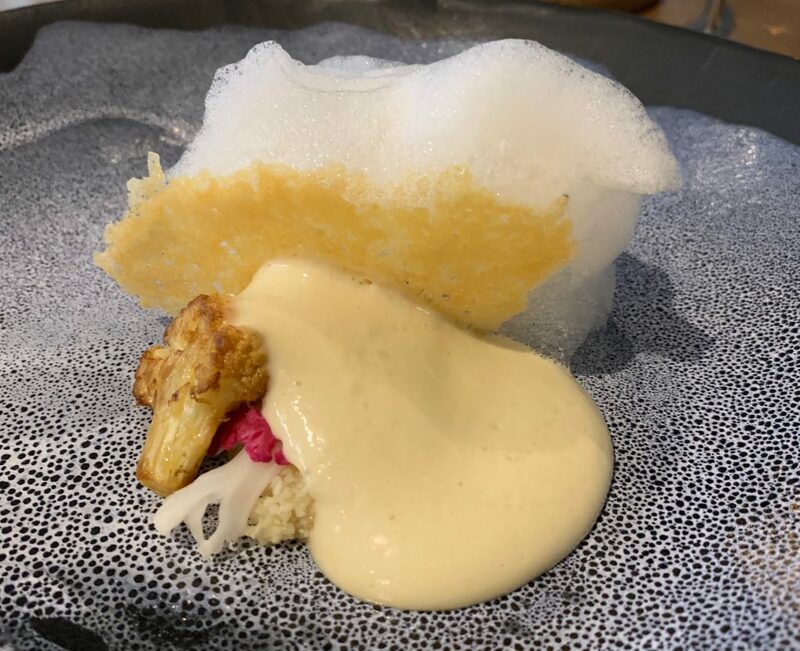 Cauliflower and Cheese: Crisp of Parmesan with baked cauliflower and a parmesan and cauliflower veloute cream sauce. Paired with the 2017 Chardonnay sourced from Elim and Stellenbosch, whole bunch pressed, and fermented in concrete egg and barrel. A flint like nose and layered, complex, creamy palate that finishes with chalky minerals and a lingering sweet oak note offer a lovely counterpoint to the cream and parmesan. With alcohol under 13%, this wine is a welcome contrast to many over oaked, overly alcoholic New World Chardonnays. 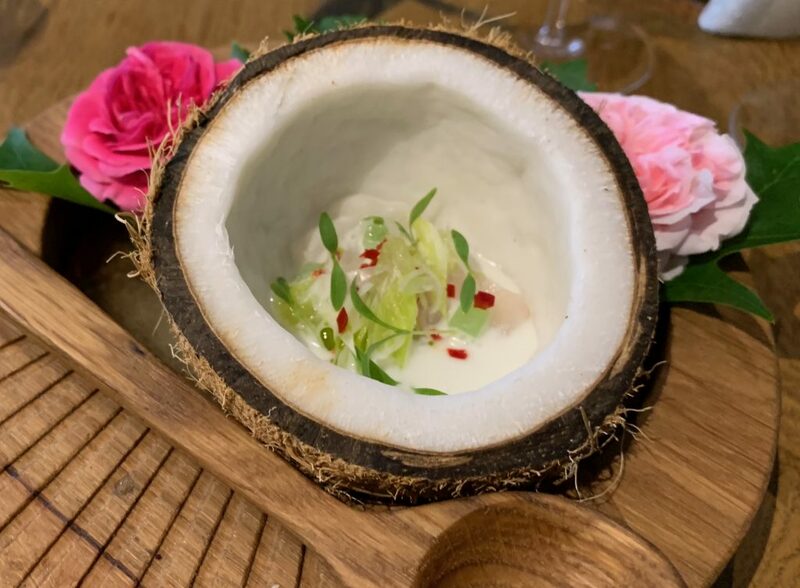 Ika Mata: Sashimi of black cod with chili and coconut cream served in half a coconut. Also, paired with the Chardonnay. Ramen: (no photo) A bowl of quail egg, pickled radish, daikon, coriander and beef broth with Wagyu beef cooked on a hot rock at the table. Paired with the 2015 Namytso Shiraz Cabernet Sauvignon. Rich, sweet dark red fruit is complemented by hints of tobacco and game that meld seamlessly with the beef and ramen. A blend of 60% Shiraz, 29% Cabernet Sauvignon, 6 % Merlot, and 5% Cabernet Franc from Simonsberg (Stellenbosch). Fermented in open top tanks with extended maceration and 20 months maturation in French barriques, 30% new. Delicious! Wild Peacock: (no photo) Wild peacock served with sticky ginger black rice, infused aromatics and garlic. Served with the 2015 Shiraz from Simonsberg (Stellenbosch), our favorite Quoin Rock red. The wine reveals sweet dark plum fruit with herbal and cracked pepper accents. Outstanding concentration with a super rich extract on the finish. Fermented in stainless steel and matured 20 months in 55% new oak. Outstanding Shiraz! 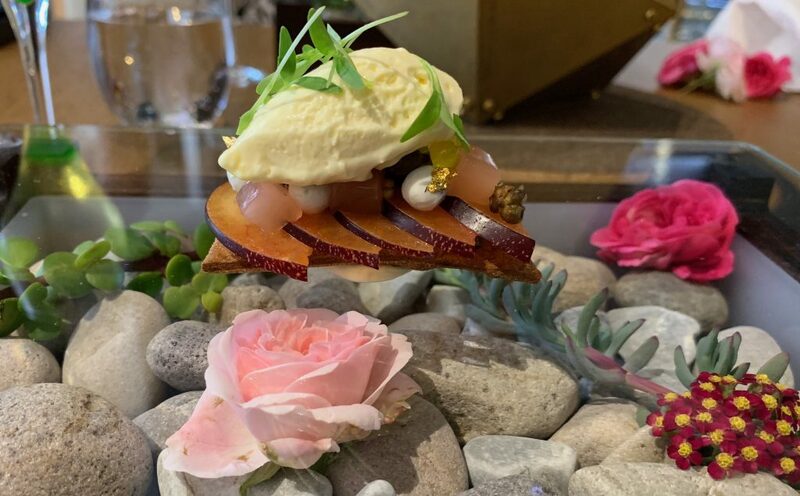 Dessert: This dish consisted of gold-leaf coated goats’ cheese, fresh plum, Parmesan ice-cream, crispy capers, goats’ cheese powder, sesame crostini and plum jelly beautifully presented on glass over rocks and flowers. Served with a rich, and beautifully balanced Vine Dried Sauvignon Blanc from Stellenbosch. Desiccated, whole bunch grapes are cold-soaked for 12 hours then pressed off, settled, and fermented in old French oak barrels where they remained for 5 months. Residual sugar of 137 g/L is offset by bright acidity, resulting in an almost dry finish. Lovely ripe stone fruit and tropical pineapple aromas and flavors. While this is not a complete list of the dishes in the full 16 course tasting menu, these plates illustrate the creativity of Chef Rikku, both in the food and their artistic presentation. As noted above, the Quoin Rock wines are well made by winemaker Jacques Maree, especially the sparkling wines and the Shiraz-based reds. While the pairings with the dishes are sensible ones, the focus of the meal is the food rather than the interplay between wine and food. This entry was posted in Countries and Regions, Dessert Wine, Red Wine, South Africa, Sparkling Wine, Uncategorized, White Wine, Wine and Food, Wine Articles, Wine Type and tagged Elim, Featured, Stellenbosch. Bookmark the permalink.